The custom of the Japanese to create a specific brand for the top-of-the-range (Toyota/Lexus, Honda/Accura for example) does not go back to yesterday. 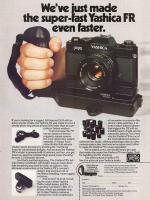 Since the middle of the Seventies, the Yashica Japanese constructor used the name Contax (at the origin a model Zeiss Ikon) and thus to name the highlights models of its range. 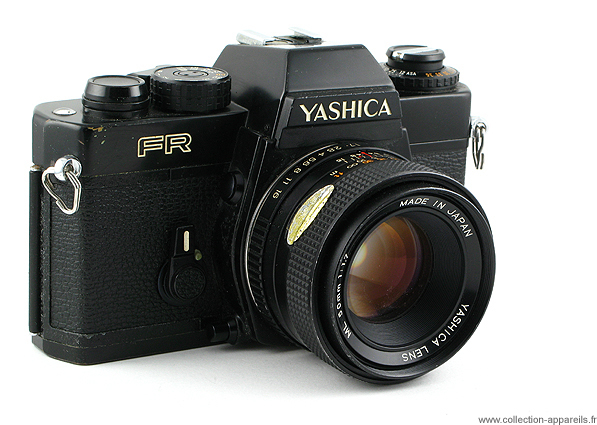 At the time of Photokina of 1976, by introduce the Yashica FR, the brand presented the “normal” version of Contax RTS introduced one year earlier. The two cameras share many technical elements… That makes it possible to find again with lower costs on the Yashica some of particularly efficient elements of Contax, like the very quiet mirror and the electric remote control. Of course, the lenses Zeiss T* can be used on this Yashica. The drive motor (2 images/second) although it does not bear the same name is the same one as for Contax. The control of the exposure is done with full aperture by two TTL cells in the centre of the viewfinder. The selected speed and the aperture appear in the viewfinder. Red or green LED indicate to the operator the accuracy of the exposure.